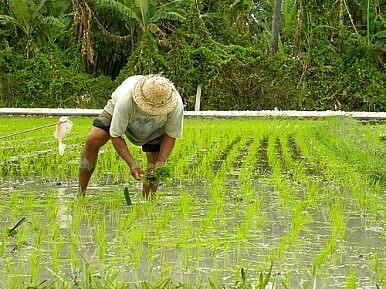 Farmers in the Philippines have destroyed 10 football fields worth of GMO crops. Unhappy with the prospect of essentially being force-fed genetically modified Golden Rice that packs an added vitamin-A punch, a group of 400 farmers in the Philippines recently stormed a field at a government research facility in Pili, in the province of Camarines Sur, and destroyed roughly 10 football fields’ (1,000 square meters) worth of the test crop. The act of mass protest was motivated by the farmers’ collective disdain for genetically modified organisms (GMO), which they said have not yet been proven to be safe for consumption. According to those who oppose the introduction of GMO crops to the Philippines – and elsewhere – the answer to malnutrition is not bioengineering, but alleviating poverty. The farmers worked not alone, but in concert with students, academics, and other members of the public under the umbrella of SIKWAL-GMO. “Golden Rice is not an answer to the country’s problem on hunger and malnutrition,” said Bert Autor, as quoted by the Philippine newspaper Remate. Autor added, “They were not able to control their emotional outburst” upon hearing the dangers of Golden Rice. “The Golden Rice is a poison,” added a farmer named Willy Marbella who also serves as deputy secretary general of a group of agricultural activists called KMP (Peasant Movement of the Philippines). Golden Rice is a GMO strain of rice developed in the 1990s by Ingo Potrykus of the Institute for Plant Sciences, Swiss Federal Institute of Technology and Peter Beyer of the University of Freiburg in Germany. The GMO crop is imbued with beta-carotene, a precursor of vitamin A that accounts for its yellow color. The motivation for developing the strain of rice was to supplement diets in poverty stricken countries where starchy foods predominate. The New Scientist notes that every year, vitamin-A deficiency kills up to 2 million people and leads to blindness in 500,000 children worldwide. Golden Rice purportedly covers 60 percent of the required daily vitamin A intake. There are also business concerns at play. Regardless of whether they eliminate the crops that spring up, the risk of crosspollination exists. If this were to happen, the farmers would risk facing boycotts on their crops. Bruce Tolentino, deputy director general of the IRRI, dismissed these concerns. “These are confined field trials,” Tolentino said. “They’re fenced. They’re covered by nets. They’re protected from rats and birds. And, we hoped, people.” Tolentino further pointed to evidence that rice generally self-pollinates and does not normally contaminate other crops. In the wake of the event, the IRRI labeled the farmers “vandals” and proceeded to release a video singing the praises of GMO. Vandals or not, the farmers’ concerns were not entirely unfounded. In June, unapproved GMO wheat was discovered sprouting from a field in Oregon this spring, which led to boycotts of U.S. wheat by Japan and South Korea. Despite what went down in Pili last week, the Philippines is one of the first Asian nations to jump on the GMO bandwagon, including corn as well. On the other hand, the country has also turned down other GMO offerings, as seen in the ruling earlier this year that a GM eggplant known as Bt talong is unsafe for human consumption. Why Is the Philippines the Home for Chinese Offshore Gambling? The Philippines' unique economic structure explains why nearly all Chinese FDI is being funneled into one sector: gambling. Malaysia’s Evolving Approach to China’s Belt and Road InitiativeWhat Will Indonesia’s Foreign Policy in Jokowi’s Second Term Look Like?Sihanoukville: A Cambodian City Losing Its ‘Cambodian-ness’Is Vietnam Creeping Into a Succession Crisis?What Does Jokowi’s Win Mean for Indonesia’s Economy?